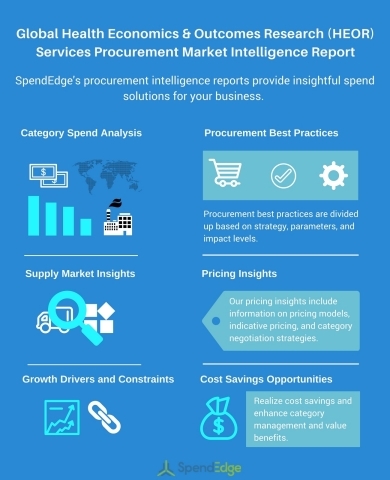 LONDON--(BUSINESS WIRE)-- Global procurement intelligence advisory firm, SpendEdge, has announced the release of their ‘Health Economics & Outcomes Research (HEOR) Services Procurement Research Report.’ The insights and data in this report provide a strategic analysis of the supply markets, factors influencing purchasing decisions, procurement best practices, pricing models, supplier landscape, and an analysis of the supplier capability matrix for the pharma and healthcare industry. This report breaks down the data and analysis behind the procurement of health economics & outcomes research (HEOR) services and acts as an all-inclusive guide for making smart purchasing decisions. “Increase in the demand for services such as assistance in filing HTA submissions due to the enactment of regulations in countries such as the UK and France, have made filing HTA mandatory leading to the high demand for HEOR services,” says SpendEdge procurement analyst Anil Seth. “Also, real-world evidence and outcome-related data are increasingly being used by both pharmaceutical companies and insurers for making business decisions regarding new products,” added Anil. Genomics science in recent years has gained prominence worldwide due to its expected benefits in drug discovery and personalized treatment. This has increased the investments in genomics science by government authorities, universities, and pharmaceutical companies. Such high investments have in turn prompted HEOR service providers to expand their services and expertise in emerging scientific fields such as genomics science to cater to their clients more efficiently. Globally, clinical trial designs are experiencing rapid changes with the introduction of new designs such as adaptive trials and platform trials. This is mainly due to the cost-efficiency of these trial designs. Moreover, the total time involved in such clinical trials is also lower than traditional models. Also, new clinical trial designs are expected to lower the cost of trial processes, leading lead to high-cost savings. The global HEOR services market is experiencing an increase in the use of big data. This is because the use of Big Data analytics and allied services in the pharmaceutical industry helps firms in improving all aspects of their business models, including HEOR. Moreover, the efficiency pertaining to data processing will improve significantly, resulting in several cost savings opportunities. Also, this may result in higher cost of the service for a short-term due to the initial investment.